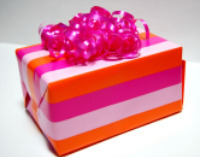 Kick start the fun by offering a cute baby shower door prize. Your guests will not only appreciated winning a cool prize but will be wondering what other great stuff you might have in store. Use door prize to fill lags in activities and to get rid of awkward moments. A Baby Shower Door Prize can be anything and the possibilities are endless. Really nice prizes are gift certificates to a favorite restaurant or department store or just a nice little scented candle. Large or small your guests will love it. Chances are that someone at the shower has a birthday that is exactly as or close to the baby's due date. The objective is to guess when the baby will be born. You can divide the calendar days with AM and PM if you like.When a guest arrives, let him pick a date and time on the calendar when he thinks baby will be born.Guests who arrive early will have wider options to choose than guests who arrive late so you can announce this game beforehand to make your guests come early. Prizes will be awarded to the person with the correct guess, of course after the baby is born. You can also give a guest one or more of these calendar ‘spots’ in exchange for bringing a little extra baby item such as diapers, formula etc. It can encourage guests to bring more stuff. Hostess will need to make miniature diapers before start of the shower. Give each person a diaper as they enter the shower. Half way through the shower tell everyone to look inside their diaper and the person or persons with a poopy diaper wins a door prize.You can write the word poop or add just a black dot to one of the diapers. Make little diapers and hide them around the baby shower, they can be glued to the gifts tableor under the snacks table or you can hide it under a potted plant or use it to make decorations but make sure to hide it in smart places to make it a challenge. Tell persons that there are diapers lost in the room and whoever finds them wins a door prize. I went to a shower where the hostess camouflages a few diapers in the decorations. You had to really look close tosee that it was a diaper. This door prize game is especially helpful for mom to be when she is ready to send out thank you cards. Ask each person to take an envelope and write their Name and address on it. Put all envelopes in a basketand pick out a few. Persons whose envelopes are drawn will win a door prize. At the start of the party, ask each guest how many baby bottles they think the mother-to-be would get that day.Write down each guest’s name with their answers. During gifts opening, count all the baby bottles received. Give a prize to the person with the best guess. Instead of baby bottles, you can also use bibs or other items frequently given during baby showers. Baby Shower Raffles are becoming quite popular these days. A raffle can be fun and creative and playing is totally voluntary so they don't have to pay if they don't want to play. For raffle drawing try to give each guest a free ticketand offer inexpensive prizes like candles or other nice items from a dollar store. However paying for raffle tickets can be a great idea because mom-to-be can use the money to buy items she did not get such as diapers ( Diapers are never too much)or to start a college fun. In this case do not charge more than a dollar for each raffle ticket. Raffles are always great door prize games that most people usually enjoy. Write in each invitation that for every pack of diaper and/or wipes they bring they are eligible to enter the door prize drawing. Mom to be will get lots of diapers and wipes and guests will win a prize for their support. As the guests enter tell them to browse the list of baby items to see what item/items on the list they have brought.Each item should have a corresponding number of ticket/s (1 formula = 1 ticket, baby wipes = 2 tickets, etc) Each guest should fill in their name on the raffle card and drop in a box. Draw a few names at some point during the shower toselect door prize winners. You also have the option of using baby shower invitations to tell guests to bring a little extra baby item that they think thebaby or mom to be will need such as cotton, formula, baby oil. This will make them eligible to enter the baby shower raffle fora chance to win the grand door prize. This way, mom-to-be can stock up on those little baby essentials and those guests that choose not to play don't have to bring that extra item.